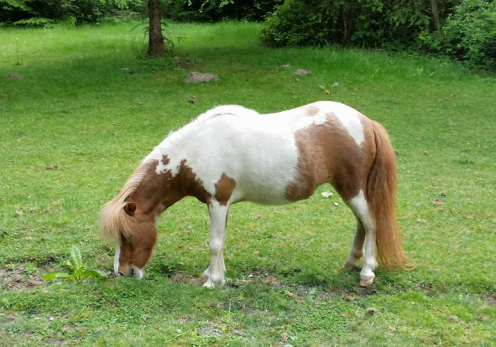 Snickers is a six year old miniature mare surrendered by her owner who was unable to provide proper care. Snickers lost her mother to colic and she was confined to a large kennel on the verge of serious illness. Now with proper nutrition, wormer, and vaccinations, Snickers is on the road to recovery. With the help of therapeutic massage, her legs are also recovering from severely overgrown cow hocked hooves. Snickers currently resides with our massage therapist and loves her new foster family. Snickers is not yet available for adoption. However, please keep checking on her progress.